This was posted on October 1, 2007 by Steve Maxwell. I had intended to finish the series of articles on evangelism last month. However, while we were on our trip, Christopher and I were discussing those to whom we had witnessed. I appreciated what he shared with me and asked him to write a Corner about evangelism. The following article is what the Lord put on his heart. It is a joy when our children embrace the Lord Jesus and want to tell others about Him. When a man has something with which he truly is thrilled, he wants others to know. It is a wonderful confirmation that the Lord Jesus is at work in our children’s lives when they will actively witness about Jesus, the only true Savior of a man’s soul. A few weeks ago, we drove on the interstate through New York City, a massive urban center with miles and miles of apartments. If you had watched me staring out the window, you could have easily guessed I was from Kansas as I watched the towering expanse of concrete, brick, and humanity pass by. We even pulled out the camera and took some photos of the city through the van window. At one point, we saw smoke drifting across the interstate ahead of us. We assumed it was a factory smokestack, but we were wrong—an apartment building was on fire. Flames were shooting almost fifteen feet high out of a fourth-story window. A fire truck had just arrived in the street below and was beginning to raise its massive ladder. I snapped a few quick photos as we passed, and we prayed for those whose lives were being impacted by the fire. It wasn’t until later, as I reviewed the photos in detail, that the significance of what we had seen really hit me. The magnified images revealed two details. The first was amazing, but the second was heart-wrenchingly incredible. As I stared at those photos, the parallels between the fire and evangelism were almost impossible to overlook. 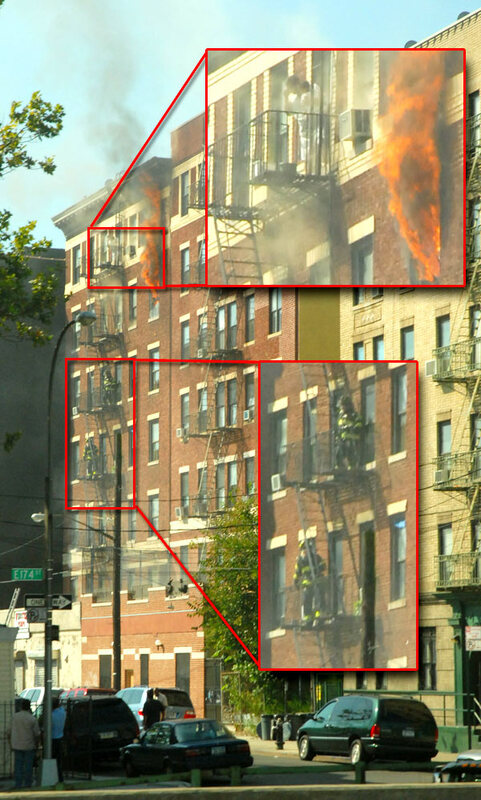 The first detail we noticed as we zoomed in: two firefighters heading up toward the flames on the metal fire-escape stairs. These men had lost no time upon arriving at the building and were demonstrating a willingness to risk their lives as they climbed closer to the fire. Their goal was not to put out the fire, for they carried no water hoses with them. Instead, the oxygen tanks they wore showed they were intending to save lives, even if it meant entering flame-filled rooms. Those firefighters had a duty and a job to perform, and they were doing it no matter what it cost them (although I suspect they were also motivated by a heartfelt compassion for those facing danger). What would have happened if none of the firefighters had responded to the call? What if they had responded to the call but then sat in their comfortable fire truck and simply watched the building burn? If either one of those situations had occurred, wouldn’t there would be many people, perhaps including you and me, who would have condemned them for their actions (or lack of actions)? For us, as Christians, not to speak up and seek opportunities to share the gospel with the lost would be a similar, unconscionable, shirking of (God-given) responsibility. “Go ye therefore and teach all nations . . .” (Matthew 28:19). We have a duty toward those headed for a horrendous future: “Where their worm dieth not, and the fire is not quenched” (Mark 9:44). “And others save with fear, pulling them out of the fire; hating even the garment spotted by the flesh” (Jude 1:23). Jesus never said that sharing the gospel with others would always be easy and comfortable. I believe Peter is a perfect example of that. He wasn’t willing to stand up and identify with Jesus when he was asked, three times, if he were a disciple. Granted, Peter was in the midst of a difficult situation, but he was nonetheless given an opportunity to speak out and share, and he didn’t. But isn’t Jesus merciful? Peter confessed his failure and repented. Grace was given. And from that point on, we no longer see a fearful man, but one who was willing to speak out, no matter what the cost. Whether a firefighter or a soul-winner, is the man who experiences fear called a coward? No! It is the one who gives into his feelings of fear and fails to do what he should. Even brave men will at times feel fear, but they choose to do what is right despite their fear! Some don’t want to be spiritual firefighters – despite what the Lord has called us to do. For those who don’t want to be a firefighter, I ask you to consider what we saw as we zoomed even closer into the photo of the fire! On the fifth floor, only a few feet over from the flames that were roaring out of the fourth-floor window below, was a woman with a child in her arms, standing on a small fire-escape platform perhaps fifty feet in the air. She was well aware of the danger her life was in if she stayed in the building. She could have chosen the way of escape for herself alone, and it would have been much easier for her to do so, because then both of her hands would have been free. However, she was taking the time and effort to see that the infant child was also safe. Have we repented of our sin and believed in the Lord Jesus Christ? Has He saved us from the flames of hell? If so, how could we be so selfish as to escape the flames ourselves (by His grace) and yet leave others to such a terrible fate? “And such were some of you: but ye are washed, but ye are sanctified, but ye are justified in the name of the Lord Jesus, and by the Spirit of our God” (1 Corinthians 6:11). Will you one day stand alone before the Lord Jesus Christ with no one else standing beside you whom you helped rescue by pointing them to Jesus? Might the work we are so busy filling our days with burn up on the judgment day? “If any man’s work shall be burned, he shall suffer loss: but he himself shall be saved; yet so as by fire” (1 Corinthians 3:15). Whether you see yourself as a firefighter or simply someone who has been rescued from the fires of hell, won’t you reach out and help rescue others? Don’t be paralyzed by fear! Let us each be bold as we gently help those who are lost and dying! This was posted on September 1, 2007 by Steve Maxwell. Last month when the Maxwell men were ministering at the homeless shelter, I spoke with a man in his late twenties. He shared how he was struggling with both chemical and alcohol addictions. That is very sad, but what he said next was even sadder. He told me that it was one of his parents who first gave him a beer and harmful illegal drugs. Last week I heard a similar story from another man. I can recall a childhood friend whose parents gave him beer so he could safely drink at home. He may have been safe, but these parents all have something in common. They have given their children appetites for what leads to destruction. The example we set for our children and how we train them should be taken very seriously because we will all stand before God some day to give an accounting. “So then every one of us shall give account of himself to God” (Romans 14:12). Praise God that most Christian families I know are attempting to lead their families away from sin instead of giving them an appetite for it. However, not sinning in not enough. We need to be living and serving as the Lord Jesus has commanded us. In the parable of the talents, the man who hid his talent in the ground was not commended for having lost nothing but instead was sternly rebuked because he gained nothing. “His lord answered and said unto him, Thou wicked and slothful servant, thou knewest that I reap where I sowed not, and gather where I have not strawed” (Matthew 25:26). In the last two articles in this series, we have discussed the Lord’s command for us to actively share our faith with others. “And he said unto them, Go ye into all the world, and preach the gospel to every creature” (Mark 16:15). By reading Acts, we see that the Apostles were sharing their faith, and we must do so, too. This month we will discuss some practical things that might be done in learning how to share Jesus. Salvation is a work of God, and it is not a work of the flesh. “That which is born of the flesh is flesh; and that which is born of the Spirit is spirit” (John 3:6). It isn’t about tricks and gimmicks, but the power of the Holy Spirit in converting souls. Religion may bring about some degree of outward conformity, but Jesus Christ changes people from the inside out. Therefore, we must be saved and in fellowship with the Lord if we desire to be used of Him in reaching the lost. We need to bathe the Lord’s command to “go and preach” in prayer and ask the Lord to begin a work in our lives so that we can obey. Since converting souls is a spiritual matter, then prayer is foundational. Do we believe God is the One Who saves? Then we must be in prayer seeking His power in our lives to develop a deep love for the lost, a concern for their lives, direction in how to prepare and share, discernment in whom the Lord wants us to witness to and that their hearts would be receptive. May He give us boldness and a broken heart for the lost, and may He lead us each step of the way. Some men have told me that their walk with the Lord is only one of “going through the motions.” If that is the case, I would encourage you to forget about sharing Jesus with others, and focus on your need for a real relationship with the Lord right away. Whether you are unsaved or carnal, I would plead with you not to rest until you have resolved it. Only then will the Holy Spirit be able to lead you as you witness. Consider beginning to be evangelistic by giving out gospel tracts. On Friday, I stopped by a business to pick up something we ordered. Right next to the loading dock was a picnic table ringed with employees on break. I paused by the group on my way into the building and gave each a “million dollar bill” gospel tract and a few “Are You Good Enough to Go to Heaven?” tracts. They all gladly received them. Later as they filed past me while I was waiting inside, several of them thanked me again. They genuinely appreciated what I had given them. I don’t leave tracts lying around public places because that can be seen as littering. However, when we are on the lookout, we will see people who are glad to read a tract that is given to them. I often watch for people who appear to be waiting. I remember once spotting a car of “tough guys” waiting outside the grocery store. I walked up and said, “You guys look like you have time to read something.” On occasion, I might add, “I think you will find this most interesting,” or “It’s just a gospel tract.” I can’t recall a person being rude or hateful, and hardly ever is the tract refused. One thing that is important when choosing tracts is that they are interesting. That is why the “million dollar bill” works very well as a conversation starter or something easy to get in their hands. We tell them it isn’t real, but they might enjoy having one, and most want one because it catches their interest. I know some families include tracts when paying bills. I think that is a good practice as long as the business isn’t paying for the postage. It wouldn’t be right to send a tract if the tract ended up costing the company additional postage to receive it. May we be an offense to no one. “Giving no offence in any thing, that the ministry be not blamed” (2 Corinthians 6:3). Finding good tracts can take quite a bit of time, so be on the lookout, or possibly ask others which ones they like. Tracts to use must be interesting and have a solid biblical foundation. The more motivated a person is, the more he will read. We like to have an assortment of tracts available so the Holy Spirit can lead us in which tract should be given. We have put up a Web page that lists tracts we have used that might help you get started. Seek the Lord’s direction every step of the way. If you sense a person is interested, then give him something that has more of a message. If not, then give a tract that may catch his interest so he wants to read more. People expect churches to be the ones giving out tracts and sharing Christ, and they suspect their motives. They often feel a church only wants members and money, so they are suspicious. If you are sharing Christ as an individual or “just as a family,” a person is more likely to be open to what you have to say. Consider having some contact information on the tract should the recipient want to know more. We had a rubber stamp made that has our www.familiesforJesus.com website on it. This way they can e-mail us if they want to dialog further about spiritual issues, but our address and phone number is kept private. Renting a low-volume website is so inexpensive these days that each family could likely do that as well. At that website, more details about salvation could be posted. However, I would encourage you not to put your family’s telephone number, e-mail, or street address on the site. Use a contact form such as you will find on Titus2.com; otherwise, you will receive a lot of spam. A side note is that you might find a family website is a great learning opportunity. There are a host of beginner books that will teach you all you need to know about developing a website. It can give great purpose for your children to have a project such as this, and they will learn skills in the process. However, be on guard that any Internet use is monitored and 100 percent accountable. We have also liked carrying our Soul Winner’s New Testaments when we are out, which have notes by the late Clift Brannon. There are notes at appropriate verses that are chained together so someone can look them up on their own, read the verse, and then read Mr. Brannon’s comments. Most of my family tries to have a Soul Winner’s New Testament with them all the time because we have had many opportunities to give a New Testament to a person who has desired more information. We started offering the Soul Winner’s New Testaments on Titus2.com at our cost because we had such trouble finding inexpensive New Testaments to give away. Make it a true discipleship opportunity as your family learns to witness. Buy one book at a time on witnessing, and go through it together as a family. We found R. A. Torrey’s book called Personal Work to be of great insight and encouragement for us. Unfortunately, that book is out of print, but you might find one on the Internet or in used bookstores. Mr. Torrey has a much smaller book that is still in print called How to Witness to Anyone. Previously I mentioned LivingWaters.com. This group targets the more mainstream Christian of today, but it might be helpful in your quest to learn to be a soul winner. We have a whiteboard in our dining room where we write Scripture verses that we want to memorize. After we ask the Lord to bless our food, we recite the verse(s) on the board. It is a great way to learn Scripture. Currently, we have most of Exodus 20:3-17 up so the family can memorize the Ten Commandments and use them when witnessing. As you have personal and family devotions, look for verses that you want to memorize for sharing Christ, then learn them at meal times. We try to have a once-a-month family prayer time for the unsaved that we know. It is a wonderful time of crying out to the Lord for those who are headed for hell. I’m thinking of one young man we met at the fair last month who was proud of going to hell. Only the Holy Spirit can bring about conviction and the realization of a man’s need of a Savior. In his youth, this boy sees himself as immortal, but in joining the Marines, he may soon find himself vulnerable. Only prayer will have an impact on him at this point. As your children observe you sharing Christ with others, it will build in them a similar boldness and desire to share also. Discussions around the dinner table and prior to evening devotions can be highly profitable for everyone as the family hears who shared Christ with another person and what was said. My family is always greatly encouraged to hear stories of what has happened in my witnessing or to share their own. Every trip out of the home becomes a new adventure as you seek to share Jesus with others. Remember to keep in mind that this isn’t an exercise like one lifts weights. It is serious business, and souls are at stake. Our hearts have to be deeply concerned for people who are going to spend eternity in hell. Then as we witness there is no personal gain in it for us. We are doing it for the other person’s benefit and in obedience to our Lord. There is so much more to the Great Commission than just obedience. There is blessing and fulfillment as well. The world’s entertainment and resulting fun is just a poor imitation for joy in the Holy Spirit. There is no greater joy than seeing lives transformed by the power of God. I can’t think of anything the world offers that can compete with that. May we give our families appetites for the power of God in action, and we won’t be disappointed—not now or when we stand before our Lord giving an account of how we have spent our lives and discipled our children. Do your children have beautiful feet? “. . . How beautiful are the feet of them that preach the gospel of peace, and bring glad tidings of good things” (Romans 10:15). This was posted on August 1, 2007 by Steve Maxwell. (You can read last month’s here.) This month we are continuing our discussion of the importance of discipling our children by helping them have a heart for evangelism and the tools to be effective in it. Jesus’ last command as He left this earth was: “. . . Go ye into all the world, and preach the gospel to every creature” (Mark 16:15). Until the more recent years, I thought I cared about seeing lost souls saved, but the evidence of my life didn’t indicate that this was a reality. I was content to live my personal life wholeheartedly for the Lord Jesus, striking up conversations when I could, and waiting for others to initiate questions about my faith that might lead to the opportunity to share Christ with them. Lifestyle evangelism is a term I often hear associated with this kind of witnessing. The truth of those years was that I wasn’t being asked by those around me to tell them about Christ, and my family wasn’t developing a passion for witnessing. I am excited now by the changes in my heart and my children’s hearts as the Lord is leading us down a path of forthright evangelism. Most people consider themselves to be good people; therefore, they believe they are able to get to heaven based on their own merit. Yet the Bible tells us differently. “But we are all as an unclean thing, and all our righteousnesses are as filthy rags . . .” (Isaiah 64:6). “For all have sinned, and come short of the glory of God” (Romans 3:23). And: “Jesus saith unto him, I am the way, the truth, and the life: no man cometh unto the Father, but by me” (John 14:6). That is why it is vitally important for people to realize that without Christ they will spend eternity in hell and for us to be actively telling them about Jesus Christ. Since Jesus commanded us to “Go ye into all the world, and preach the gospel to every creature” (Mark 16:15) and the world needs Christ, why is it that believers of today are not witnessing? I’m sure there are numerous reasons, but I wonder if there are several very common ones for not witnessing. I will list a few in no particular order and what Scripture says in comparison. First, some don’t know how to witness. This can be a hindrance, but should it be? If Jesus gave a direct command to someone, wouldn’t you expect him to obey it? Would Jesus give a command that couldn’t be obeyed? Of course not. If we don’t know how to witness, then we need to learn how. “Study to shew thyself approved unto God, a workman that needeth not to be ashamed, rightly dividing the word of truth” (2 Timothy 2:15). We don’t want to be disobedient to the Lord’s command to witness just because we don’t know how to do it. We learn how, and then we obey. Second, some don’t want to offend people. That is fully understandable because we should not want to offend. To get in someone’s face and passionately tell him he is going to hell will likely be offensive. However, if our motive is love and we are deeply concerned for where they are going to spend eternity, they are much less likely to react negatively. “If it be possible, as much as lieth in you, live peaceably with all men” (Romans 12:18). If a person is unaware that he has a serious illness from which he will die unless treated, he will be grateful if you care enough to tell him of his disease. If our motive is viewed as selfishly trying to get someone to come to our church, the person is far more likely to react negatively than if we are seen as striving to introduce the person to a relationship with the only true God of the universe. Often, after I have shared Christ with someone, I will ask whether I have offended him in any way. Most people will not only say that I haven’t offended them, but many will also add that they are grateful for what was said. Third, some are embarrassed to tell others openly about Jesus and don’t want them to think they are extreme. “Whosoever therefore shall be ashamed of me and of my words in this adulterous and sinful generation; of him also shall the Son of man be ashamed, when he cometh in the glory of his Father with the holy angels” (Mark 8:38). I think Paul’s position on whether he cared if others thought him foolish is the one to take. “We are fools for Christ’s sake, but ye are wise in Christ; we are weak, but ye are strong; ye are honourable, but we are despised” (1 Corinthians 4:10). It doesn’t matter if others think of us as fools as long as our Lord says, “Well done thou good and faithful servant.” Amen? Fourth, perhaps some think they are too busy, and witnessing takes too much time. Can you imagine yourself on the way to an important appointment when you notice a baby stroller rolling out into the street? You know that soon a car will hit it, killing the child inside. Do you stop, putting yourself at some risk, to rescue the baby? In addition, you know that you will miss your appointment because after pulling the child from danger, it will take time to contact the authorities and find the parents. Certainly, we would put our agenda aside and do what needed to be done for the sake of the child. “. . . he that winneth souls is wise” (Proverbs 11:30). I have realized that I may regret not speaking to a person about his soul, but I won’t regret doing it. Fifth, sadly, there are many whose faith is not anything worth sharing. I’m convinced this is true quite often. When a person has something he is excited about, you can’t stop him from telling others. In the following passage we see that the Samaritan woman hurriedly left to tell others in the city about Jesus. “The woman then left her waterpot, and went her way into the city, and saith to the men, Come, see a man, which told me all things that ever I did: is not this the Christ? . . . And many of the Samaritans of that city believed on him for the saying of the woman, which testified, He told me all that ever I did” (John 4:28-29, 39). If we have a vibrant relationship with Jesus, we will want to tell others about Him. For many of those reasons why others don’t witness, I, too, have wanted my abiding in Christ to mean only that I read my Bible, pray, and live a “righteous” life. However, I have come to see that the ultimate of abiding is relying on Jesus Christ to give me boldness, gracious words, a loving heart, and the power of His Word in sharing the Gospel—not simply lifestyle evangelism but rather purposeful evangelism. We speak the Word; God brings the harvest. My responsibility is to be obedient; God’s responsibility is to bring the increase. “I have planted, Apollos watered; but God gave the increase. So then neither is he that planteth any thing, neither he that watereth; but God that giveth the increase. Now he that planteth and he that watereth are one: and every man shall receive his own reward according to his own labour” (1 Corinthians 3:6-8). The question of “lifestyle evangelism” versus Jesus’ command to “go and preach the gospel” can best be addressed by Peter and John’s reply to the council. “But Peter and John answered and said unto them, Whether it be right in the sight of God to hearken unto you more than unto God, judge ye. For we cannot but speak the things which we have seen and heard” (Acts 4:19-20). I hope this helps make it very clear the sort of evangelism Jesus has asked us to practice. As we disciple our children, we should not neglect this important area. We want to encourage our children that telling others about Jesus and their need of Him is one way to show our love for them. What friend would sit back quietly while someone he cared about was headed for disaster? When Jesus said we are to “go and preach the gospel,” He meant exactly that. We want our children to understand the importance of this in a Christian’s life. What is the fruit of these past few years of our learning to be overt in witnessing out of a desire to be obedient to Jesus’ command to go and preach? My younger children are growing in their desire to give away Gospel tracts when they are out and leave them in public places. My older children want to receive telemarketing calls and make business-related calls such as ordering things and asking product questions. This gives them the opportunity to practice witnessing. They have also begun to share Christ face to face with those they come in contact with. We try to have a monthly prayer night usually with an emphasis on outreach. We have had the extreme privilege of leading several to the Lord Jesus Christ in just these few years—more than we had in the previous twenty-five years or so since my salvation. We have encouraged others in their relationship with Jesus Christ and in the importance of spending time every day in the Word. Many others, who have not made a decision for Christ, have indicated an interest in reading the book of John and considering salvation. Maybe the greatest benefit of evangelism in discipling my children, which I alluded to last month, is that I have observed overtly sharing my faith with others strengthens my children’s faith. First they see Dad who is so in love with his Savior that he wants to tell others. They know that Dad’s faith is real and precious. What is important to a child’s father is impressed on the life of that child, and his desire for Jesus will grow. The children are also drawn to want to do what their dad does, and if Dad is sharing Jesus, they will want to as well. Not only is the witnessing of Jesus a command, but there are so many benefits from it that we can’t be remiss in this important aspect of discipling our children. My heart is thrilled with the changes in my family concerning the reality of sharing Jesus Christ with lost and dying souls. Is it your desire for your children to be strong in their faith and dynamic soul winners? Are you stuck in the lifestyle evangelism rut, lacking the fruit of seeing changed lives for Christ? Do you have beautiful feet? Do your children have beautiful feet? “. . . How beautiful are the feet of them that preach the gospel of peace, and bring glad tidings of good things!” (Romans 10:15). Could I encourage you to start with your own life, and then lead your children to follow you? “And every one that heareth these sayings of mine, and doeth them not, shall be likened unto a foolish man, which built his house upon the sand” (Matthew 7:26). In the next part of this series, I will address exact ways our family has been learning to witness and how that has worked out in reality.